Best Trip Ever: Hmmm...so many to choose from. I am lucky to have been on many trips with family, friends, and colleagues. If I had to pick a favorite, I would say it was a family and friends 10 day trip to Ireland...what a magical place! Best Travel Advise: Don't buy your trip strictly on who has the lowest price. Consider the agent who has the knowledge and service to match you with the vacation experience that is best for you. And, we highly recommend that you buy the trip insurance. If by chance you need it, you'll be very relieved that you did. Helping couples bring the vision of their wedding day to reality has been my passion for 24 years. I started as a vacation consultant with a large agency in 1994 and found that my gift was working with couples planning a destination wedding. Take advantage of my experience! Having helped over 400 couples fulfill their dream has truly made me a specialist in this exciting niche of the travel world. 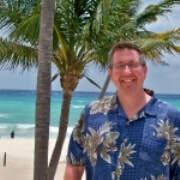 I have traveled the world extensively, and have been to the beaches of Mexico and the Caribbean over 50 times. Many of these trips were to meet the wedding coordinators at the resorts and tour the venues where ceremonies and receptions are held. This first-hand knowledge and personal relationships with the wedding coordinators on site is extremely important in helping you choose the perfect location for you and your guests. Most of the destination weddings I have done were 30 to 100 guests, so doing groups of any size and having the knowledge it requires to manage them, is a very helpful tool that I bring to you. This experience and these relationships, the tools I have created to make the planning process as smooth as possible, and my attention to detail and to each and every client, work to make the wedding of your dreams a reality. By working with both you, your guests, and the wedding coordinators on site, I can offer you everything from choosing the perfect spot to assisting with planning every detail of your big day. Take advantage of an experienced travel advisor and the value we bring to your vacation. We rely on our personal experience, not reviews on websites from people you don’t know. And if we haven’t been to your resort—we usually know someone who has and can give you first-hand feedback. Sometimes there are “cheaper” options but if we don’t mention them to you there is a reason and the price saved is truly not worth it. We choose hotels based on "your needs and expectations." Just because a vacation was great for someone else, doesn't mean the same vacation will be great for you. Matt Salas-Vacation & Cruise Specialist-Western U.S. I have over twenty years of travel industry experience and bring a wealth of knowledge to help plan out that perfect vacation for all my clients. I am passionate about leisure activities rounding out a well-balanced life. As an avid skier (how could you NOT be living in Colorado? ), golfer and bicyclist, leisure travel was a perfect fit for me to help others find just the right place to play at just the right price for their pocketbook. At Sunsational Beach Vacations, I do just that. This is a different kind of Travel Company. I emphasize personalized travel plans to your desired destinations while providing excellent online content and easy online window shopping and booking access. Growing up in Denver provided a backdrop of beauty unsurpassed in mountain vistas. Those views can only be rivaled by pounding surf on beautiful beaches around the world. Let me help you find the perfect place to relax and enjoy with family or friends. Let me help you maximize the value of your leisure budget while minimizing the expense of it. Best Trip Ever: I have many favorites but the best is usually one of your last trips. This year was experiencing the beautiful, breathtaking fjords of Norway on a Holland America Cruise: sea kayaking in the fjords next to the majestic "Seven Sisters Waterfalls" in Geirangerfjord, finding many of the Viking burial grounds in Eidfjord, walking in the Bergenhus Fortress in Bergen established in 1240. Wow, what a trip! Having been in 9 destination weddings where my roles have been in all varieties- Groom, Best Man, Groomsmen, and Pastor I have had a great deal of experience with how things flow. Not to mention all of the numerous destination wedding groups I have worked with over the years as well. This experience allows me to put brides and grooms at ease when they are selecting a resort for their big day! I understand how many details each wedding entails and work my best to ensure that each couple knows that they never have to worry about their groups travel needs knowing that myself and the Sunsational Beach Vacations team is always available and willing to take care of everything. Know that we've been through it and seen it and are ready for you! There are a lot to choose from and I am very fortunate for that! The joys of being an agent is we need to see a ton of resorts! But the one trip that is near and dear to my heart would be my own destination wedding at the Moon Palace in the Riviera Maya near Cancun Mexico. It was PERFECT! The Moon Palace provided our group of 55 everything we needed. As each Palace Resort always does the service was incredible, and the views were stunning! Each and every member of our group loved everything! Generations/ El Dorado Royale- It was my first time visiting Generations and I loved it. The room was HUGE! It had a full living room, dining, room, two bathrooms and a walk out personal pool. Of course this was an upgraded room, but the standard suites are similar too. The food was absolutely outstanding too as Karisma resorts specializes and grows their own produce for each of their resorts. The freshest and best ingredients ever. I believe you deserve a vacation that delivers the best experience for the hard earned dollars spent. When it comes time for us to discuss the ultimate beach vacation options, I can lend first hand knowledge for dozens of All Inclusive resort destinations. What type of vacation experience are you looking for? I am here to help! Best Trip Ever: So many to describe as my best trip ever, but I would have to rank Cabo San Lucas right up there at the top. I stayed steps from downtown, where the resort offered hilltop sweeping views of the bay on the back side with relaxing pools, beach and ocean on the front side! Zoetry Montego Bay (a boutique resort that offered tranquility in every way). Two different resorts with two very different vacation experiences - Something for everyone! When planning for your next vacation, don't just shop price. Let me guide you through a budget that will have you returning with the excitement and need to go AGAIN"! Interested in Joining the Sunsational Team? Here How!